WebProof is supplied with the most common templates used to view a job. 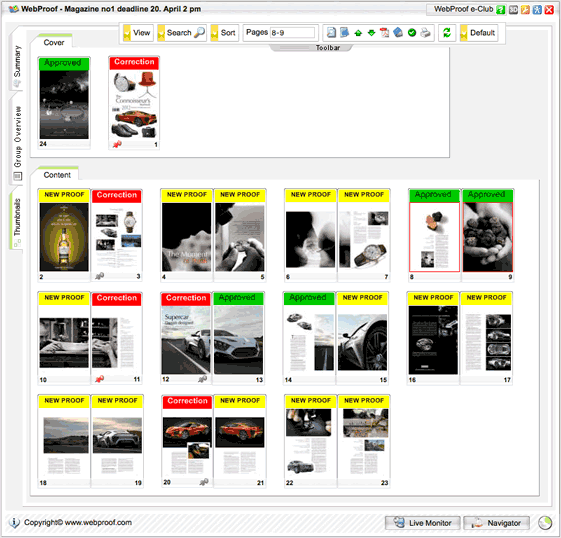 For example, single pages for websites and PowerPoints, or Cover + Content as spreads. However, custom views can also be created. Note: Costum view is not available in FREE and BASIC WebProof versions. See more about FREE and BASIC setup here. Right-click "Custom Views" under "Settings" and select "New Custom View". Enter the name of the new custom view. Enter the name that will appear in the tab. Additional tabs can be created. Single Page means that there is ALWAYS only 1 page if the content starts with a single page, and after one or more spreads, always ends with a single page. Single unlimited means there can be multiple single pages. Dual page means there can ONLY be 1 spread. Dual unlimited means there can be multiple 2-sided spreads. After completing point 5, first select the page (a red frame will appear). Click on the icon to the left to confirm the definition. If a line break is required within the tab, click the "Line break" icon. Max. 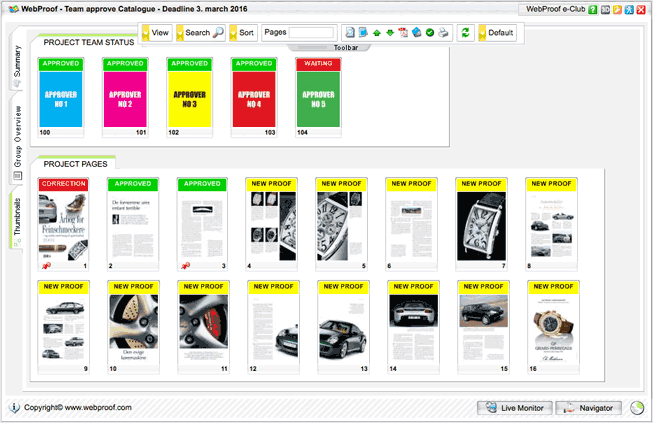 width specifies the maximum number of pages/rows. When this custom view template is complete, click "OK". When creating a new project or opening an existing choose Costum and standard views. Write the pagerange in the tabfields. Note that it is only possible to write composite numbers like "24,1" if the costum view tab is made with Single Page or Single Page Unlimited (see section 5). The numbers in a tab with Dual Page or Dual Page Unlimited will always have to be coherent in pairs like "1-24", "2-23" or eg "1-2, 4-5, 9-10...". Below is another example of a custom view where the top-tab is used for a team to give status on project level. This could also be relevant if eg a whole department (like Quality Assurance) needs to give general approval to a project despite of the page level comments from other departments. Note: If a custom view is edited when in use, it will disappear from the job(s) to which it has been applied. However, a job can always be viewed in standard view or modified to use a new custom view.